Tom Casey and Jim Knutson have offered their time to serve as officers for the Marathon Sail and Power Squadron. Tom and Cindy Casey are members of MSPS and they also belong to MYC. Cindy has also indicated a willingness to help with Squadron functions. Jim and Wendy Knutson moved to Marathon earlier this year. Jim is Tom's nephew from California and is joining our power squadron. A little background information is offered below. That's 2 of the 3 primary bridge officers. Since neither Tom nor Jim are familiar with Power Squadron officer functions, I've (Greg) agreed to stay on this coming year as Commander again if we don't have a qualified person to step in. Other members of the existing bridge will help out where needed as well. HOWEVER, we really do need this Commander position filled by someone new as well. I'd keep helping out in other positions. I believe that there are other members of our squadron who are familiar with squadron functions and may have served as officers elsewhere. If you are one of these experienced members, please consider stepping in and serving as Commander for this coming year with Tom and Jim coming up behind you. Nancy Miller so meticulously published for many years for us). arrange food/bar and speakers for each month that we hold a meeting. None of these positions require excessive time or effort, especially if we get more people to help out. Please consider your part in our squadron and whether you can help with any of these positions. You can call or email, or even better show up at the Nov 11th Exec meeting to discuss your potential involvement. Tom Casey, a retired Orthodontist, and Cindy, a retired accountant and active travel agent, were both born and raised in the San Francisco Bay Area. Tom and Cindy, started in USPS 25 years ago as members of Diablo Power Squadron. They are avid boaters, fishermen, and divers, being past members of the Benicia Yacht Club, and current members of MYC. Tom and Cindy have cruised their 44' Navigator extensively in the SF Bay area, as well as down the California coast and into Mexico. They have chartered in the Abaco's, BVI's, San Juan's, and from Sitka AK, down to Seattle. They currently own a new 44' Aquila power cat, and a 29' Pro Kat. Tom has served as President of: Martinez Rotary, Martinez Kiwanis, Martinez Chamber of Commerce, Contra Costa Children's Dental Health Foundation, Alacosta Divers, Inc, and served on many other Boards. Tom and Cindy, along with Cindy's nephew Jim Knutson and his wife Wendy, (new prospective members), can add new enthusiasm and fun leadership to MSPS. Jim and Wendy Knutson: I started boating when I was about 8 in the California, I have always had a love for being on the water under power or sunder sail I did not matter. I have mostly spent my time in the California Delta and Bay Area and of course many of the lakes in California. I also have a love of volunteering, and have contributed to California Waterfowl Association where I earned Volunteer of the Year for 2008, California Department of Fish and Game as a hunter education instructor for many years, Foster Family Services where I served as a a Volunteer Director of Development, and at Andreas Cove Yacht Club as Social Chair. After moving here to the Florida Keys, a true boaters paradise about a year ago I have wanted to become involved with a locals boaters association and found USPS in need. I look forward to serving on the Bridge. This will be a fun, short talk. Roy Boylan has many years experience with USPS, coming from the Chicago Power Squadron. He teaches many USPS courses and we hope to have him present one or more later this year. He also has served as a boat captain for Wendella Boat Tours in the Chicago River, and this is the topic of this month's short talk. These are really interesting boat tours - going through the downtown canyons of chicago. Lisa and I have done the tours, and we've also navigated the Chicago river on some of our Great Loop Cruises. Don't miss this talk. It might just motivate you to take a fun trip to Chicago next summer or fall, stay at one of the nice hotels downtown in the loop, and take one of these cruises. Tell them that Roy sent you. 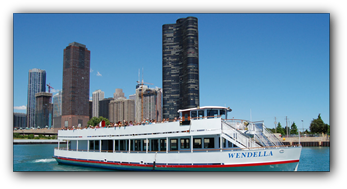 CLICK HERE for Wendella Boat Tours website. The meeting starts with the open bar about 6pm at the Squadron Building on Loggerhead Lane. A main dish will be provided (volunteer to pick this up please?). Please bring a side dish to share. $10 contribution for the main dish. A cash bar for donations is also available. We also need volunteers (1 or 2) to man the bar that night. CHRISTMAS BOAT PARADE RINGSIDE SEATS!! - Our Power Squadron has been sponsoring this parade since 1997, organized and run by Gregory Absten. This month is YOUR CHANCE to get front row seats for the parade. Enter the drawing at our Nov 17 dinner meeting to have your name drawn as the Power Squadron representative for judging of the parade. You'll get the front and center seats for you and your significant other at Dockside Tropical Cafe where the boats will come close-by for the judging. Judging is not hard and there are not a lot of rules to follow. Just decide what boats you like 1st and 2nd best in each category, and best overall. Voting among the 3 judges determines the winner in each class. No complicated rules to follow. Come to our Nov 17th meeting and put your name in the hat for drawing that night. You must be a current or pending MSPS member to win. Other judges will be from the Marathon Yacht Club, and USCG Auxilliary. If you're not one of the judges - enter your own boat in this parade. Follow the link below. CLICK HERE for more information on the Boot Key Harbor Christmas Boat Parade, and the registration form to enter your own boat.